SAU broke ground on two major athletic projects this spring. The first, on April 27, celebrated major upgrades upcoming for the Mulerider Track and Field facility. The renovated track and field facility will once again allow SAU to host sanctioned track meets, something that has been impossible for several years due to the age and condition of the track surface. 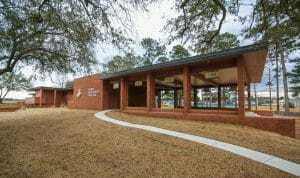 Major construction on the project is not slated to begin until later this summer and will take about six months to complete. In the past, SAU track teams have enjoyed great success within the sport. As members of the Arkansas Intercollegiate Conference, the SAU men’s and women’s track teams brought home a combined 12 conference championships between 1967 and 1995. 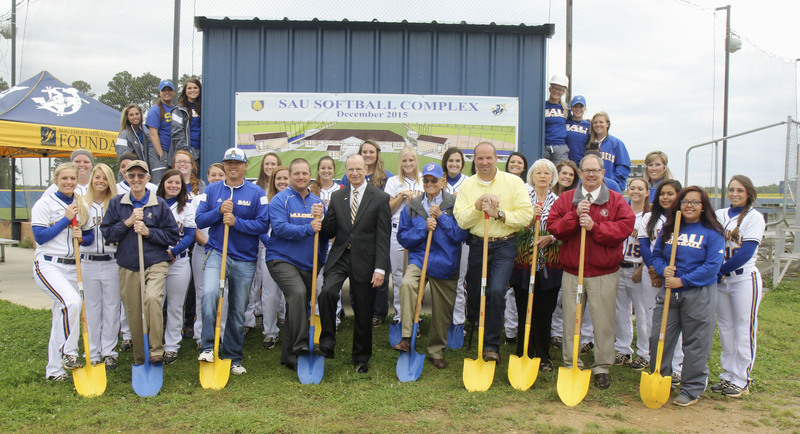 SAU hopes to knock one out of the park as it breaks ground on a Muleriders break ground on two big projects $1 million expansion to the Mulerider Softball Complex at 10 a.m. on Tuesday, April 28. 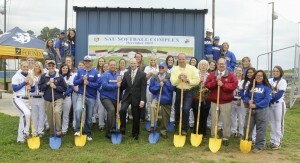 On the day after the track groundbreaking, the Mulerider Softball broke ground for their upcoming facility additions. 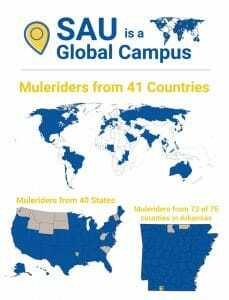 University officials have planned the construction of a new field house to meet several needs for the Mulerider softball program. The facility will house not only the team’s locker room and coaches’ offices, but it will also provide public restrooms, press boxes, a ticket booth, and a concession stand for the two-field complex. Lights will also be constructed on the main field. The project has been designed by CADM architects. Major construction is expected to begin this summer with a completion date before the opening of the 2016 softball season. Opportunities for private investment are available for both of these exciting projects. 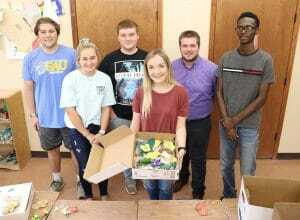 For more information, contact Jeremy Langley, assistant director of development, at (870) 235-5375.